One of the key terms used in geography is elevation. Whenever we talk about a natural or man-made location around the globe, elevation is one of the key statistics associated with that place. Elevation can be measured in feet or meters and is the term used to describe how high a place is above sea level. In some cases, elevation can also refer to places below sea level. A simple example would be the United States’ most famous and populous city, New York City. NYC has an elevation of 33 feet (10 m), meaning it is 33 feet above sea level. Many major American citizens are located near or on the coastlines, meaning that they have relatively low elevations in general of around 500 feet (152 m) or less, but the United States is also home to many mountain ranges and high points. Typically, as one moves further inland, the average elevation of the land begins to rise and many of the highest elevation points and cities around the United States can be found away from the coasts. The top three states with the highest mean elevations, for example, are Colorado, Wyoming, and Utah, all of which are located far from the east or west coasts. The point with the highest elevation in the United States is Denali, also known as Mount McKinley. Denali is found in Alaska and is actually the highest mountain not just in the United States, but in the entire continent of North America. Denali has an elevation of 20,310 feet (6,190 m) above sea level. When compared with other mountains around the world, Denali isn't at the same level as mountains like Mt Everest, which has an elevation of 29,029 feet (8,848 m) or K2, which has an elevation of 28,251 feet (8,611 m), but it's still one of the largest and most impressive natural sights in the world. The native Koyukon Alaskan people coined the name Denali and have used it for many centuries. 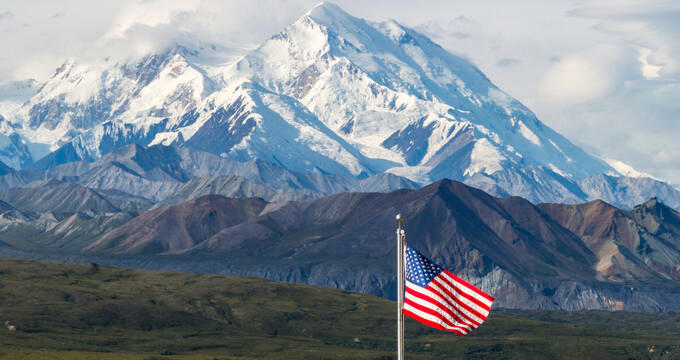 The mountain was given the name Mount McKinley, in honor of William McKinley, the 25th President of the United States, in the late 19th century, but the name was officially changed to Denali in 2015. As well as having the highest elevation in the United States, Denali is also the world's largest vertical rise and the third most prominent and isolated peak on the planet. Alaska is home to many other extremely high mountains, making up the top ten highest summits in the United States. The highest elevation point outside of Alaska in the United States is Mount Whitney in California, which has an elevation of 14,505 feet (4,421 m). In terms of cities, Leadville in Colorado is the highest statutory city in the United States. Leadville is located in Lake County, Colorado and has an elevation of 10,152 feet (3,094 m). It's an old silver mining town with an estimated population of around 2,600 people. For a time, back in the 1800s, it was the second most populous city in the entire state, but the mining industry rapidly declined and the city shrank over the years. Colorado is also home to several other extremely highly elevated towns and communities. Alma, for example, has an elevation of 10,355 feet (3,156 m) and is the highest incorporated municipality in the United States, having its own post office, which is the highest of its kind in the country. The Colorado town of Montezuma is also higher than Leadville, with an elevation of 10,335 feet (3,150 m), but is just a statutory town, rather than an official city. As Colorado is home to the highest city and highest incorporated municipality in the United States in the forms of Leadville and Alma, it’s no surprise that Colorado is the state with the highest mean average too. Colorado has a mean elevation of 6,800 feet (2,070 m), which is a full 100 feet higher than the mean elevation of the second highest state, Wyoming, which has a mean elevation of 6,700 feet (2,040 m). The state with the largest elevation span, i.e. the difference in elevation between the highest and lowest points in the state, is Alaska. The highest point in the state of Alaska is Denali at 20,310 feet (6,190.5 m), while its lowest point is the waters of the Arctic Ocean and Bering Sea, which are at sea level, giving it a total elevation span of 20,310 feet (6,190.5 m).